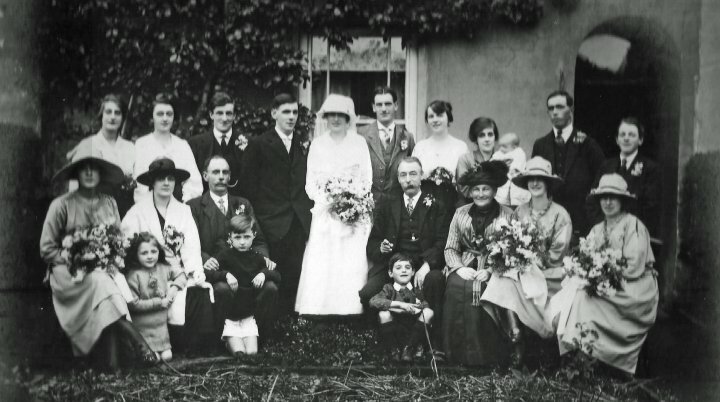 This wedding photograph shows the families and friends of Alfred Edward Hobbs and Jane Bartlett after their wedding in the Church of St Mary the Virgin in Pilton in July 1920. A report on the wedding was published in the North Devon Journal on 8th July 1920 and is included elsewhere in the archive. Thanks to Mary Passmore for passing us this photograph from the papers of Jennie Hobbs who died in January 2018. Jennie was the daughter of Alfred and Jane and was born in 1923. We have identified a number of those in the photograph. Front left is one of the bridesmaids, Nell Reed. The bridegroom and bride are centre left at the back, with the bridegroom’s brother, Jack Hobbs, next to him. Sitting to the right of the bride is William Bartlett, her father, and second from the right, on the back row, is Fred Passmore, the father of Mary Passmore. Second from the right, on the front row, is Minnie Bartlett, the bride’s sister, who was one of the bridesmaids, and is Mary Passmore’s mother. The third bridesmaid, on the right hand end of the front row, was thought to be Mabel Martin. We don’t know where the location is or if it still exists, so suggestions are invited. We would also like information on any other others present who have not been identified.